Because I use a button that alternates between 2 sounds, and it’s not possible to get it to work without handling it ing script. So I’ll need to handle scrolling through the setlist (up and down) like is possible when using midi global settings. How can I scroll through the setlist - increment song parts, then on last song part, go to the next song with the same cc code up and cc code down? In the preferences there is a check box where you can define that it should stay within a song or not. That preference setting doesn’t seem to have any effect when using gpscript to scroll through song parts. I get the current song part, then increment it and set the the song part in gpscript. When I try to go to the next song part, nothing happens it doesn’t go to the next works only within a song. When I try to go to the next song part, nothing happens it doesn’t go to the next works only within a song. When I use gpscript to getsongpart then increment that integer to setsongpart- it will not go to the next song. Yes, your are right as the function only sets a songpart within the song. 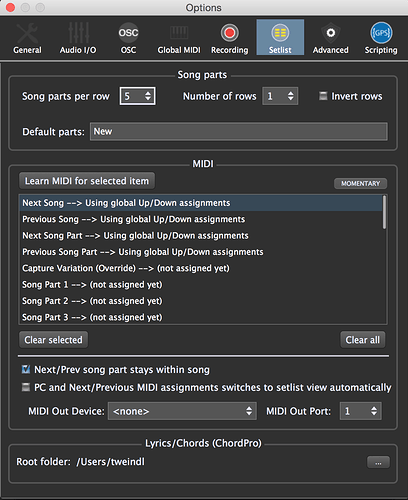 I think, there maybe should also be a ‘SetSong’ and some functions to get the whole number of songs and songparts so that you can get the boundaries of those arrays (which i guess they are) and set/get the needed index of which song and which songpart you want to ‘navigate’ to. Actually there seems to be no way to see in GPscript, if a song is over and also no way to switch to the next or another song. Take a look at this gig, this could be a very minimalistic workaround when you are on Mac. Yes, SetSongPart sets you to a specific part in the current song. You can’t arbitrarily increment it to get to other songs. Correct – and that’s currently a work in progress.